This chapter presents a case study at the local level in Ethiopia. It begins by showing that some farmers in the Oromia region have switched from planting locally adapted seeds for food barley to externally sourced seeds for commercial malt barley production, suggesting a loss of seed sovereignty. However, it also shows that the same farmers are continuing to plant their traditional food barley seeds in segregated plots, thereby maintaining seed sovereignty. 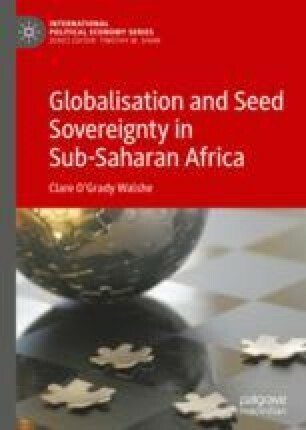 It discusses why the Ethiopian government encouraged a shift from food to malt barley production following pressure from international corporate and commercial interests and why the government has allowed local farmers to continue to exercise seed sovereignty over some of their land. These practices are consistent with a transformationalist interpretation of seed sovereignty. AFSA and GRAIN. 2015. Land and seed laws under attack, who is pushing changes in Africa? [Online]. Available from: www.grain.org [Accessed 22nd January 2016]. Ohno, K. 2009. Ethiopia: Political regime and development policies [Online]. Available from: www.grips.ac.jp/forum/af-growth/support_ethiopia/document/Jun09_DD&ADLI_10E.pdf. [Accessed 12th February 2013]. GRIPS Development Forum: Tokyo.